Are you getting some lovely fall days? Those cooler days and clear nights around here are perfect for an after dinner walk. Something about being outside always inspires me. Joe and I were admiring the fallen leaves that were beginning to change color. That walk and those lovely leaves are what I had in mind while I worked on this page. I wrote on above the leaves, "In Autumn I imagine the trees dream". This quote relies heavily on the Mary Oliver poem "Song for Autumn" It is a luscious poem and you can read it here. Here is a process video. Unfortunately, I didn't film the section where I used Dreamweaver Embossing paste. 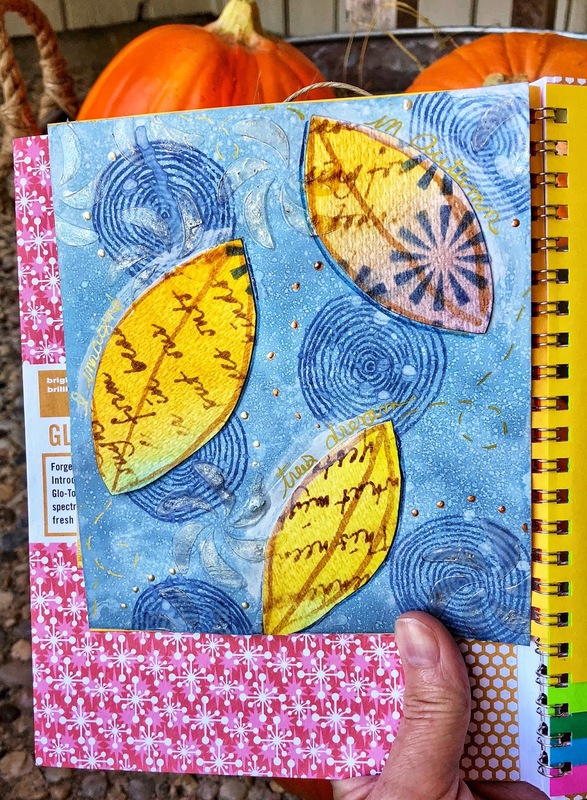 I used Dina Wakely's Bendy Pinwheel stencil to had subtle movement. If your look for them you can just see them. The leaves I cut from an old motherboard. A motherboard is awesome for art journals because you make one big texture paper and use it for all sorts of things. To learn more about motherboards click here. Our lesson today? Go for a walk, find something cool or interesting, and take it home. It might just spark your creativity. Materials: All materials either come from my Etsy shop Pink Bunkadoo or Amazon because I live in the sticks. Amazon affiliate links doesn't cost you.